My in-laws visited this weekend and we went to Magic at the Mill. We have never gone to it in all our years living here. There was lots to see and do, but my kids loved all the model trains. Thankful for the poinsettia my friend brought me yesterday. It has brightened up our kitchen table. Really hoping the cat does not try to eat it. I am once again doing the December Photo Project. Here is Day 1! My child care kids have been fascinated by ice lately. This morning we made this ice wreath we could hang outside. As the temps rise throughout the day, we can watch it melt. Here in our corner of Oregon, we get very little snow. Most winters we hover around the 40’s and 50’s. This past week we dipped low into the 20’s and puddles from previous rainstorms froze. Finding ice chunks in our little pond and backyard puddles was a treat and kept the kids entertained. The winters here differ from the frigid northeast and Midwest winters I experienced as a kid. Saying good-bye to the lake effect snow and shoveling the driveway nine years ago was not very difficult. I am not a huge “snow” person. But I embrace the cool, crisp winter air. It reminds me of God’s handiwork with the changing of the seasons. There is beauty in the dark winter mornings and the cold afternoons. I may not be much of a winter person, but I do appreciate this time of year. When it comes to exercise, I get asked this a lot. If I had “a A + B = C” answer, it may only work for a certain few and not pertain to your situation. Honestly my motivation waxes and wanes. Since I have been running off and on for fifteen years and dabbling in triathlon for three, I feel like I am at liberty to share a few things. 1) I need rewards: I was reading this spring that we make our decisions based on rewards. We may do something that is not always pleasant and maybe not fun because we reap the reward it provides. For instance I hate cleaning but I love looking at my sparkly organized kitchen. Running is the same. In the very beginning and for many years afterwards it was unpleasant and I didn’t enjoy it. But I loved the accomplishment afterward. That reward motivated me for many years and still does during tougher weeks. 2) I need more tangible rewards: I was trying to incorporate track runs into my marathon training and I hated the anticipation of doing them. Often I would skip them all together. Because Jamba Juice and Dutch Brothers coffee are both close to the track, I would reward myself with a juice or coffee after a track run. 3) I need to be running with others: It took many years to find people to run with mostly because of my unpredictable schedule with babies and toddlers. Now I love the fact I have to get up and meet my friend for a run. It is a waste of her time to leave her on a street corner waiting for me. I’m a bit of a people pleaser and in this situation it works in my favor. 4) I believe our bodies were made to move: Our ancestors had to endure physical labor or they would starve or freeze to death. No one had to go for a run because they worked their bodies all day long. Now with many desk jobs and work from home positions, we spend a lot of time sitting. I don’t believe God created everyone of us to be an athlete, but I do believe we are to honor Him with our physical bodies. Part of taking care of our bodies is getting out and moving. 5) I need activities too…not just my kids: The kids sporting world is overwhelming to me this day in age. There are many options and so much pressure to be a star. I honestly think some moms should have their children take a season off from sports and they as moms should pursue their own activity or sport. Many moms I have spoken to share how running or going to the gym helps them be better moms because they are getting their exercise time in. 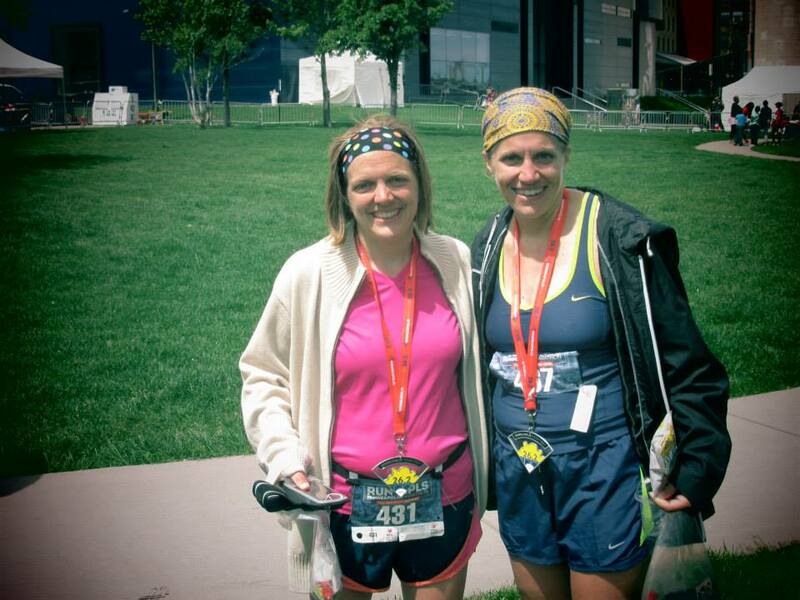 6) I want to set an example for my kids: My kids see me run and do triathlons and support me in my endeavors. I don’t know if any of them will be runners or triathletes, but I am exposing them to it. As a kid I remember my dad going to the gym or taking me on bikes. If exercise is part of our normal lives, it makes it much easier for them to incorporate it in their lives as adults. 7) I believe it is more than image and weight loss: I do not agree with weight loss companies that heavily focus on image and pounds lost. That rarely motivates me. I do not weigh myself on a regular basis. I have found that when I do, I get too obsessed with the scale. I get overly discouraged and I am more likely to quit and start eating whatever I want. 8) I need healthier ways to cope with my anxiety: I’ve struggled with anxiety pretty much my whole life. Soon after I picked up running, I was working for a church as a youth director. I was on the phone with someone I was trying to plan an event with and we were not seeing eye to eye on an issue. I told this person he/she was not treating others fairly. I have a difficult time standing up for myself. I also tend to communicate with too much emotion. I managed to hold it together but it was exhausting. I hung up the phone fuming with anger. I went for a run and pounded out four miles at a fast pace. I felt amazing afterwards. I remember telling my friend, “I had no idea running could do that.” It really clears your mind and in some ways brings you back to reality. So often anxiety clogs our brains making us only see anxious thoughts. 9) I need to be outside: I have appreciated the seasons, God’s creation, my own neighborhood, weather in general, and quiet mornings since I took up running. 10) I am out there and trying and sometimes that is enough: I’ve heard some moms don’t want to run outside or go to the gym because they fear everyone is watching them. You may not believe me, but people aren’t watching you. Even if they are–who cares? You’re out there and you are trying. Some moms don’t want to enter races because they don’t want to be dead last. Even if you are dead last, you are still faster than the person who is sitting on the couch doing nothing. Focus on your own goals and don’t worry so much about what others are doing. Really they aren’t watching you! If anything they are cheering for you. The running community is a pretty friendly one. So there you go. 10 motivators. Go tackle that run! We have this ongoing “When I was at summer camp” (said in a whiny voice) joke in our family. It means whenever you come home from an event in which you were the only one who participated, nobody in the family wants to hear every single detail about what you did. This has been an interesting summer because I went to Camp Calvin as an adult counselor & leader last week. 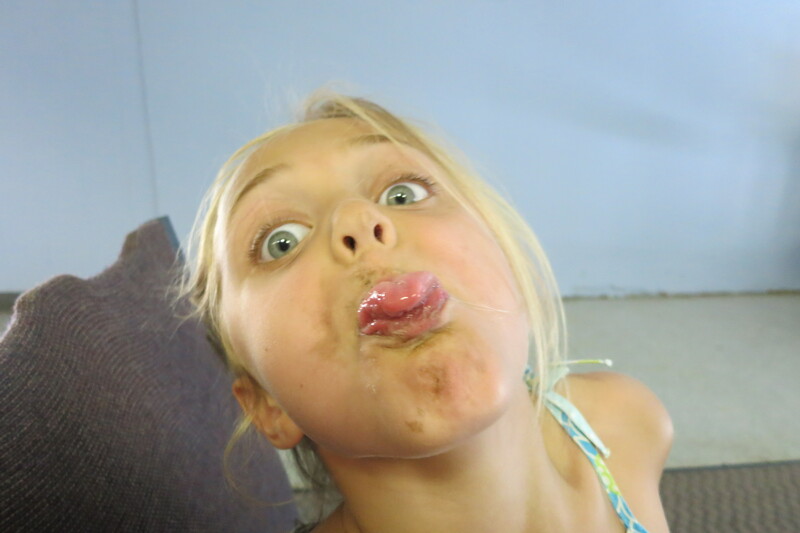 This week the oldest is at Lutheran Camp. We’re covering the main areas of the Reformation with Calvin & Luther. The husband went to Synod (annual meeting of our denomination) in early June which might as well be a camp for pastors. Rather than share every single detail of Camp Calvin I’ve narrowed it down to 10 observations about being an adult at middle school camp. 1) Getting middle schoolers to go to bed is just as difficult if not MORE challenging than putting babies and toddlers to bed. 2) Middle school boys and girls are starting to like one another. 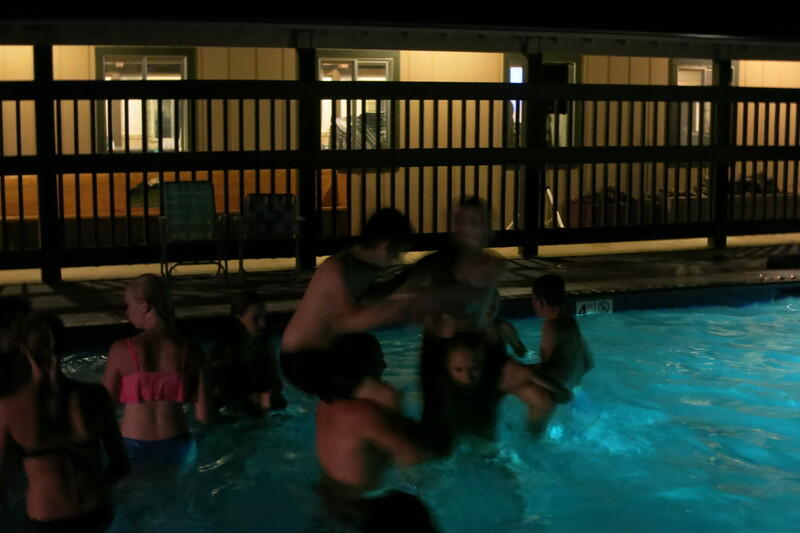 However it comes out in strange ways such as whacking one another on the head with pool noodles. 3) I swear my five year old grew an inch while I was away. I keep looking at her and she seems much older. 4) I may be a marathon runner and triathlete but I cannot for the life of me run up a 2 mile trail on a mountain and run 2 miles back down. 5) I may be 38 years old but I can still go down a natural water slide. 6) Middle schoolers have no idea how old adults are. Some thought I was right out of college (really!? ), in my 20’s, in my young 30’s, and for a minute someone thought I was a camper! 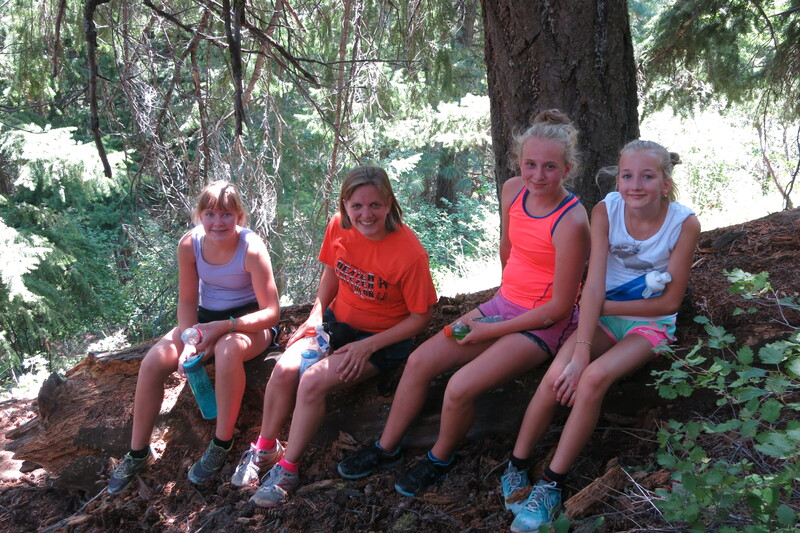 7) Sleeping on a camp bed in a lodge with eighteen middle school girls and sharing a bathroom can be exhausting for introverts. Thankfully I’m an extrovert but I still had to get my space once in awhile. 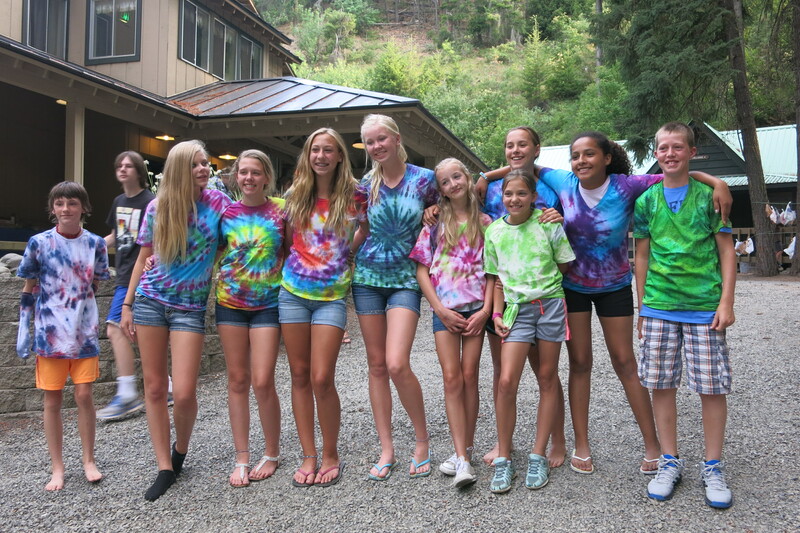 8) I friended all my new camp friends over 25 on Facebook and all my middle school campers on Instagram. 9) A camp diet that includes gooey cinnamon buns, peanut butter cups, and regular Mountain Dew is hard to break once returning home. I should have eaten a salad for lunch but all I am craving right now is potato chips and chocolate. 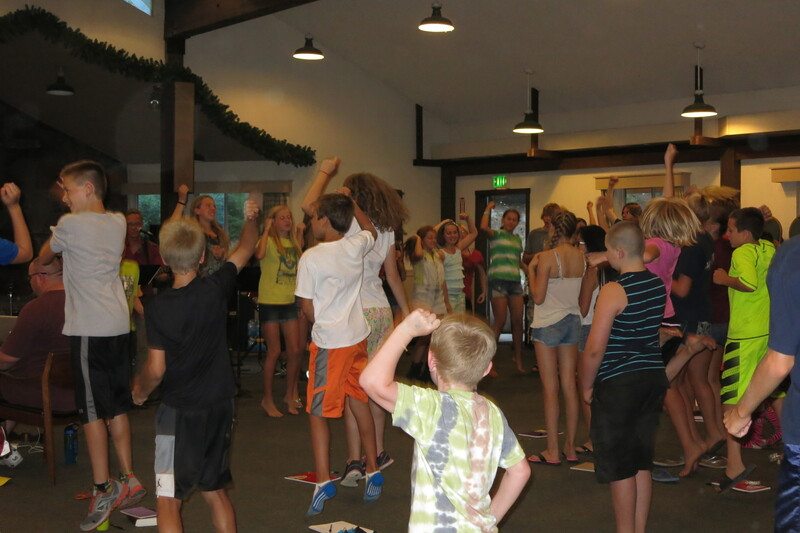 10) There is nothing as beautiful as 63 middle schoolers singing praise to the Lord and engaging in sweet fellowship. Their rock hard faith in Jesus Christ is one that can inspire us. I started running in 2001 at the age of 24. I ran my first marathon in October of 2006 at the age of 29. No one in my family ran back then and some thought I was crazy. Why would I want to fork over one hundred dollars to enter a race not to mention the countless hours of training? It took my older sister many years until she finally “got it.” I never held it against anyone. I knew what I was gaining from running and it was enough to keep me tackling marathons. 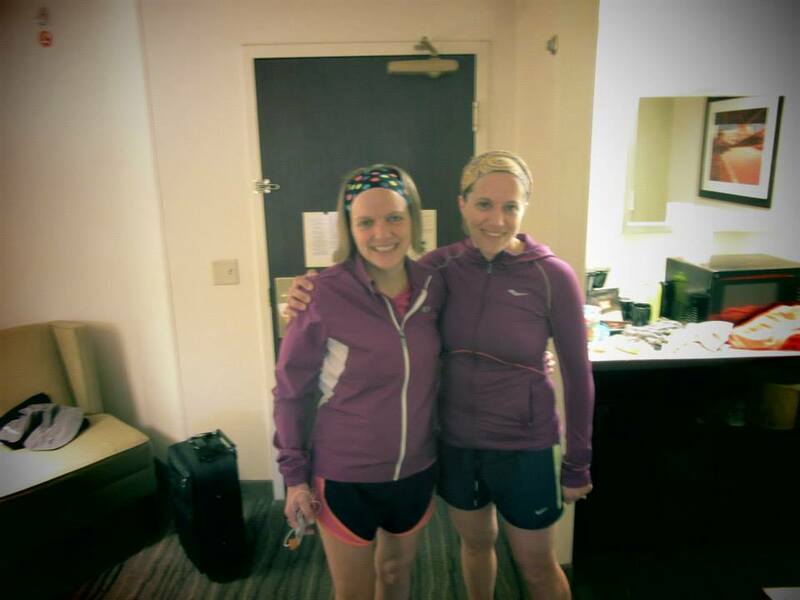 So my sister and I had talked about doing the same marathon at some point in 2015. We live on opposite sides of the country. I loved the idea of doing “a destination” marathon and traveling somewhere. I wanted to do a spring marathon because I have found it much easier to train all winter and run in the spring versus training all summer for a fall marathon. I don’t work in the summer so you would think I have more time. However, our summer weekly routine is not consistent. It is hard to train when you are home for a week, go out of town, home another week, and then go someplace else. Not to mention the heat! We looked at a marathon calendar and narrowed it down to a few options. 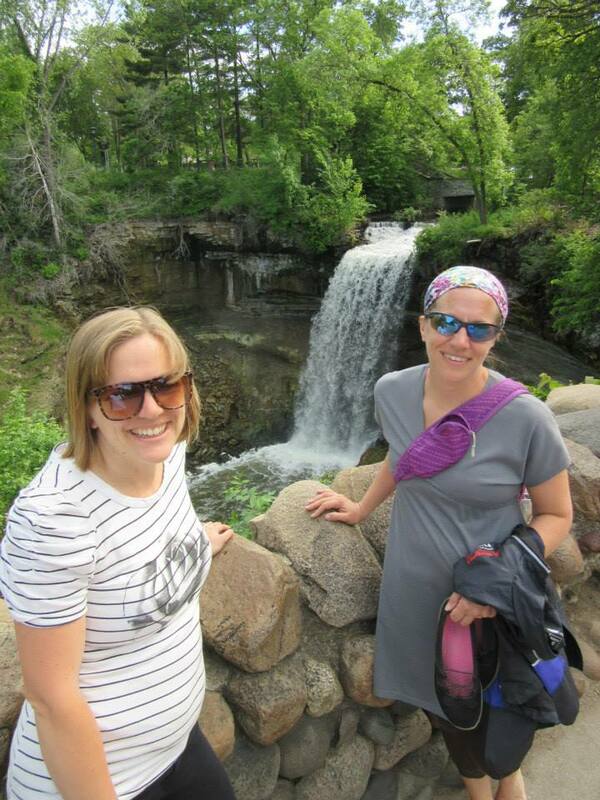 We chose the Minneapolis Marathon because the timing was the best. It was the only weekend in the spring I had nothing going on. The course looked great running through parks and along the Mississippi River. I wanted to do a run in a larger sized city versus a small community marathon. I had no idea I was signing up for a marathon that had only 700 runners. Then I remember the large marathon is Minneapolis is the Twin Cities marathon which is in the fall. However, my sister and I found some advantages of running “a medium sized marathon” versus one with 10,000 runners. I awoke at 2:00 AM on Saturday, May 30th. I slept without waking up from 10 PM to 2:00 AM and felt pretty rested. I think when it comes to this whole marathon experience I am grateful for all the solid sleep. When it comes to travel and racing, I never seem to sleep well. I had to catch a shuttle bus at 3:15 AM. My husband did not appreciate the shower going followed by my hair dryer–but hey I was not about to travel all day without doing my hair. I made it to the shuttle bus on time. Everyone on the bus was curled up on the seats and trying to sleep but I was wide awake. 4:30 AM seemed way too early to eat breakfast so I waited until around 5:15. I get up this early to workout so it didn’t feel excessively early to me. I did enjoy a breakfast burrito at one of the new restaurants in Portland International Airport. I boarded my flight and had a three hour layover in Kansas City…which by the way is one of my least favorite airports. It is claustrophobic, not enough food choices, and the bathrooms were not very clean. I got to Minneapolis in the late afternoon and my parents picked me up. We enjoyed a pasta dinner at Olive Garden with my sister and her husband. Another great thing about this marathon is I felt like I got the nutrition right. I ate everything I trained with. I had a Honey Stinger organic vanilla waffle bar and a few homemade mini zucchini muffins while in the motel rooms and a half wattle bottle full of Ultima sports drink. I ate a banana in the car. I had a Hammer gel while at the starting line. I felt like I ate enough and everything was sitting well. We drove to the starting line from our motel and had a little bit of a scare. As my brother-in-law drove on a major highway, a “wrong way driver” was coming at us. She was on the wrong side of the median. There was not very much traffic on the road so my brother-in-law easily pulled off to the shoulder while slamming on the horn. We did not want to turn around in fears we were about to witness a head on collision. I think I saw her get off the highway, but our hearts were pounding. Our guess she was a drunk driver coming home from a party in the early morning hours. Thankfully we got to the starting line in one piece. We had to walk about a half mile to it. After a stop at the port-a-potties and snapping a few pictures, I lined up with the 4 hour pacing group. This was my first marathon with my little ipod shuffle. I also wear my iphone on my arm band. This was for the purpose of texting my brother-in-law and parents following the race if I could not find them. A small race advantage is finding your family right away. I don’t listen to music through my iphone because we don’t get much date per month with our plan. So I am the dorky runner that wears a iphone on my arm and a shuffle clipped to my shorts, but I am OK with that. I have not run my previous marathons listening to music. The jury is still out on whether I would run with music or without should I run another marathon. On one hand I loved having music at the very beginning. This is when my nerves are at their worst. Having the music calmed my anxiety level and “pumped me up.” I focused more on running and less on trying to keep up with the pacing group. However, I really got tired of the music by around Mile #21 and looking back I could have turned it off. By that point I did not care about anything but finishing strong. The run started through many scenic parks and we could not have asked for better weather. It was in the 50’s and sunny. My brother-in-law cheered for us at Mile #4 and then a few miles later. Again another small race advantage is he did not have to deal with a lot of traffic and weaving through crowds. This was very motivating. 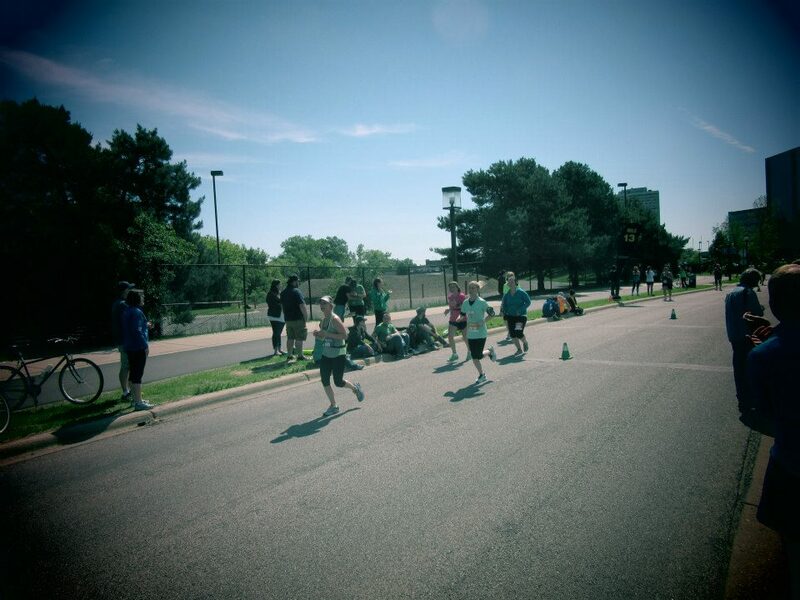 I was able to stay between the 4 hour pacing group and the 3:45 group most of the first half. As we get further into the city we ran through the University of Minnesota. At around Mile #12 the half marathons turn off and go to the finish line. Us full marathoners keep going and then turn around at Mile #17. We were going down some massive hills and my only thought was “Oh no we are going to have to go up these on the way back.” I trained on big hills (there is no way around them in Oregon) but I still hate them. At the turn around around Mile #17 (or it could have been closer to #19) I felt like I was dragging. My brother-in-law yelled to try to stay on the 4 hour group’s tail. I really tried, but it was extremely hard. I hated having them pass me, but I could not keep up with them. Once I stopped to walk through an aid station, they were almost out of sight. I was a little disappointed because I wanted to break four hours. I knew if the 4:15 group caught up to me, I would not PR at all. I tried to think positive thoughts. It is a beautiful day. 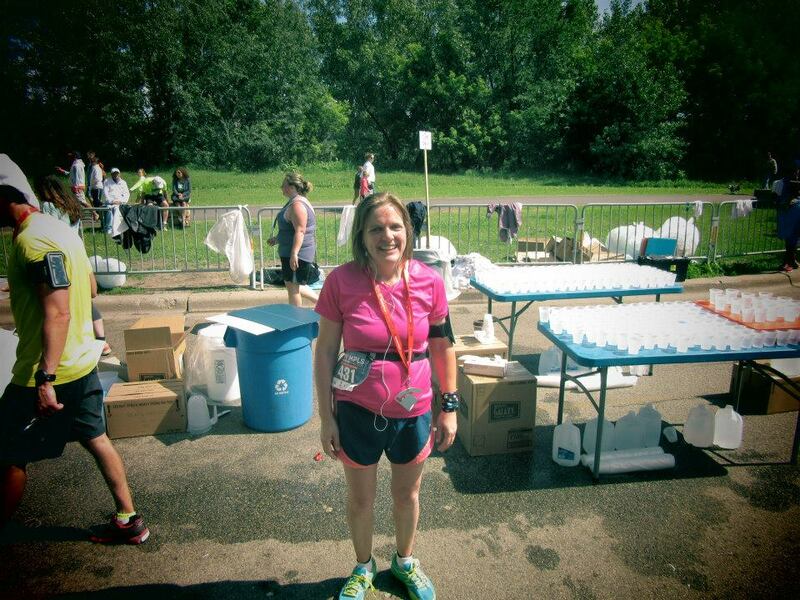 I am running in a marathon–my fourth! How many people can do that? I worked hard in my training. I gave it my best. I am not walking but running mostly–how can I ask for more than that at this point? The big hills that came at Mile #22 and #24 plain stunk. They were terrible and I had to stop and walk up most of them as were many others. My right knee often starts to give out around this point on marathons and my form falls apart. It is almost harder to run downhill so I did not appreciate reaching the top and going back down. Once I saw the Mile #25 sign I put in my last surge of energy and I ran most of the way. It was a blessing to see my dad at Mile #26 and I pushed as hard as I could to the finish line. I was excited to see 4:04 as I crossed the finish line. I did not break 4 hours, but I did PR. The 4:15 group never caught up to me! My sister had suffered an IT band injury while training. I was not sure she would be able to finish let alone run the marathon. So I had a twinge of anxiety as I saw the 4:15 group finish followed the 4:30. Her husband said she was strong until Mile #20 maintaining a 4:15ish pace. While watching her I was shivering. 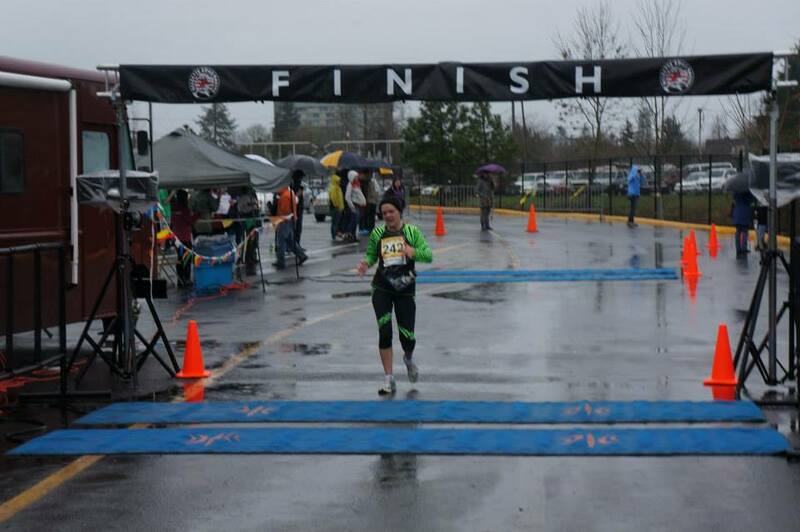 I had my cell phone out of its case so I could snap a photo of my sister as she crossed the finish line. I left my jacket in the car and they did not give out space blankets. My dad lent me his sweater, but as I put it on I clumsily dropped my phone on the asphalt. The phone still works but has a nice scratch going across it. I tried to not let it ruin my mood. My dad somehow found himself in a conversation with a homeless person. My brother-in-law and I stepped away in fear we would be too distracted and miss my sister coming in. My sister crossed at 4:55 and she looked strong. It was amazing to share this moment with her. 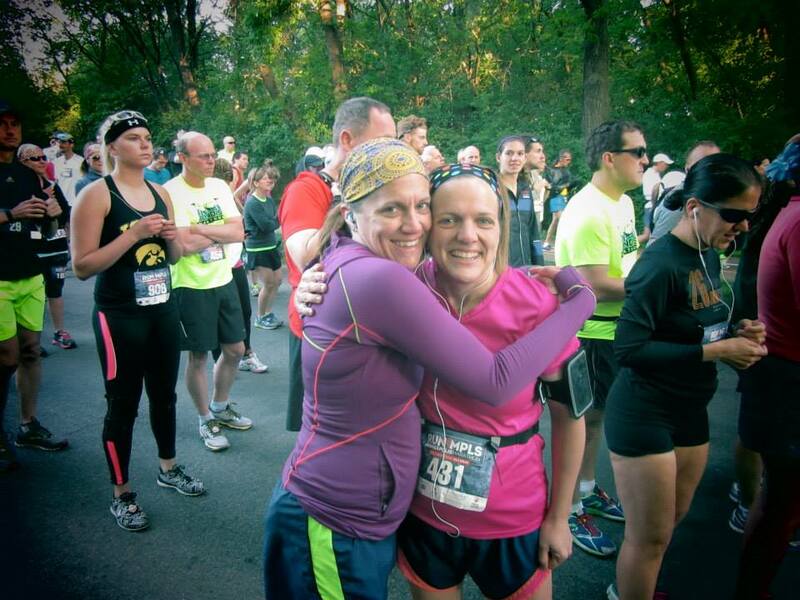 My first ever marathon with a family member and I could share it with my sweet sister. We left the marathon soon after. Honestly walking to the car was almost worse than the last few miles of the marathon. This might be TMI but if you are thinking of running a marathon, your bladder can do weird things post run. I intentionally went to the bathroom right before getting in the car so we would not have to stop. It was only about a 15 minute drive back to the motel so I assumed I would be OK. A few minutes into the drive I had to GO…BAD! There was nowhere to stop…we were downtown and there were no discreet bushes or trees. My brother-in-law graciously dropped me off in front of a hotel where I went as fast as my sore legs could carry me to the lobby bathroom. Then I waited on a street corner until he could come back from me. The rest of the weekend was relaxing and a time of celebrating family togetherness. We had a lunch at the motel and said good-bye to my brother-in-law who was flying home that afternoon. My sister, parents, and I went out for a nice dinner. The following morning we had breakfast together and I met an old friend who lives in the area for coffee. My sister and I did not have a firm plan for the rest of the day. We just wanted to explore Minneapolis. We started out an outdoor sculpture park my husband and I had gone to about fourteen years ago. 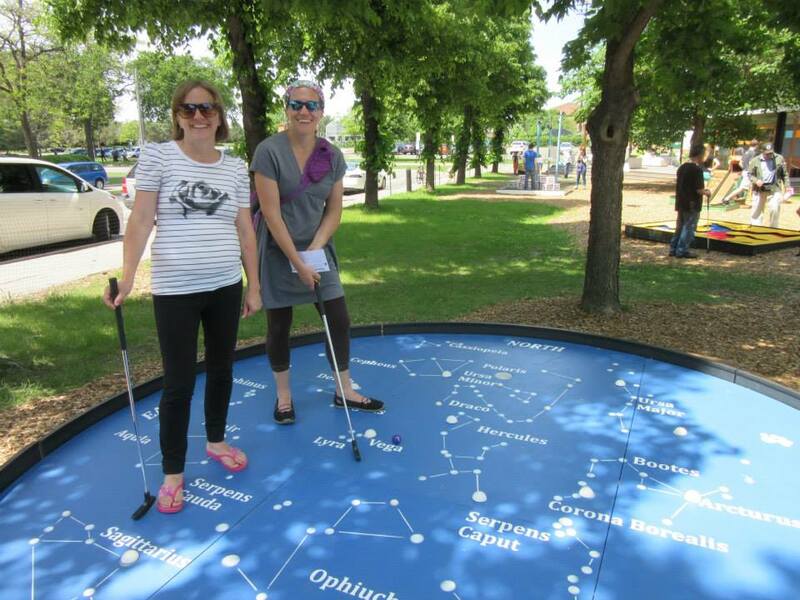 There was a mini golf course with actual art you golfed around. I had never see anything like that and we had fun playing mini golf. Who won you might ask? We tied of course. Then we went to the Minnehaha Falls which my husband and I had also gone to in November of 2001 and it was COLD! I loved having more time to sit and view the falls. 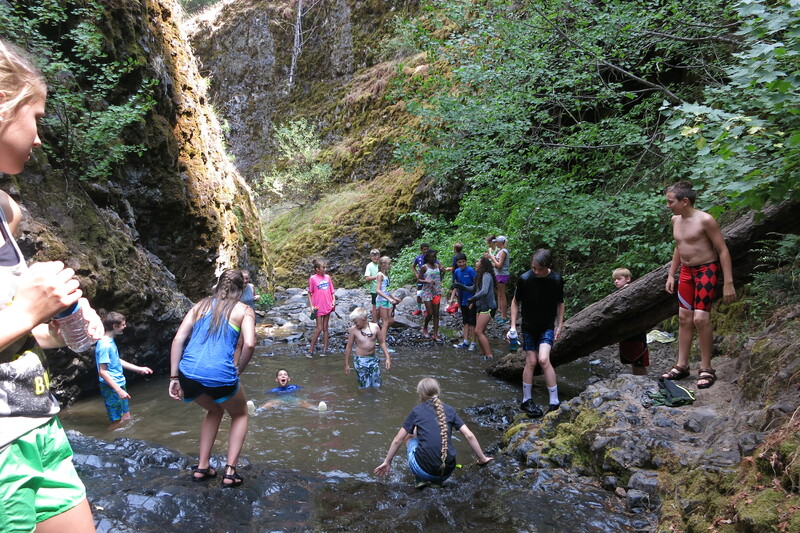 No major hiking for us–we were SORE! We had dinner at a Lebanese restaurant we found on the Diners, Drive-Ins, and Dives website. Then my sister wanted to go shopping. I felt a little dead by that point but I did go to a few stores with her and bought presents for the kids. I wanted to be home in time for children’s school musical. When I booked the trip the musical was scheduled for before I left. Because of auditorium rental schedule changes, they had to move it to the last week of school. Because my bus was running fifteen minutes behind I missed the oldest child’s piano solo, but my husband recorded it on his phone (LOVE technology!). I saw the rest of the program. By the time I got home I was exhausted and jumped right into a crazy week of wrapping up work, 8th grade graduation, Education meeting, end of the school year picnic, street hockey, strawberry picking, husband’s Open House, husband’s karate test, and more Open Houses. Let’s just say I am glad our pace slowed down this week!! I am blessed to have completed Marathon #4. I have not made any firm decision on future races or triathlons this summer or fall. Let’s just say I am already back to running, swimming, biking, weights, and street hockey–I just can’t seem to slow down.